A survey shows less enthusiasm to buy than last year. We'll know more Nov. 2. Apple (NASDAQ:AAPL) fans are known to leap at purchasing the tech giant's newest gadget -- no matter what the price. But the newest iPhone lineup might be testing customers' frugality. A new survey from RBC Capital Markets reported by CNBC shows that there is less demand for the latest iPhone models compared to last year's iPhone 7 and iPhone 7 Plus models. This year's models include the iPhone 8 and iPhone 8 Plus, as well as the company's 10th anniversary, fully redesigned edition known as iPhone X (pronounced "iPhone Ten"). According to the survey of 4,000 prospective iPhone buyers, 64% said they intended to purchase one of the three models released this year, vs. the 71% of respondents in 2016 who said they wanted to buy the iPhone 7 or iPhone 7 Plus. One could argue that the prices are turning otherwise eager customers away. The iPhone 8 starts at $699, the iPhone 8 Plus starts at $799, and the iPhone X starts at $999. Last year's lineup started at $649 for the iPhone 7 and $769 for the iPhone 7 Plus. However, Apple also might be reducing sales of its latest models by not phasing out the iPhone 6s, which originally came out in September 2015, because it gives customers more phones to pick from, RBC Capital Markets' Amit Daryanani wrote. 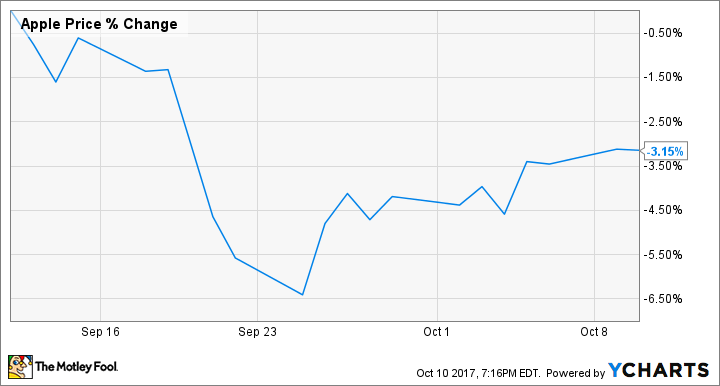 Since Apple unveiled the new iPhone models on Sept. 12, the company's stock has fallen roughly 3%. The stock is still up about 34% year-to-date as of this writing vs. the S&P 500's more modest 13% climb. The performance of the new iPhone lineup is crucial for Apple because the company claimed in May that iPhone sales were down because customers were holding out for its newest models. "We are seeing a kind of delay in purchasing behavior that we think is a consequence of the number of rumors and reports about future products," CEO Tim Cook told CNBC. Apple sold 211.9 million iPhones in 2016, a drop from the 231.2 million units it sold in 2015. Investors will get a first look at sales of the iPhone 8 and iPhone 8 Plus when Apple releases its fourth-quarter report on Nov. 2. The report covers the period through the end of September, meaning it will include the first week of sales of the iPhone 8 and iPhone 8 Plus. The iPhone X will not be available for preorder until Oct. 27. Apple previously forecast fourth-quarter revenue of $49 billion to $52 billion and gross margin between 37.5% and 38%. In the year-ago period, Apple reported revenue of $46.9 billion and gross margin of 38%. Since the 2013 first quarter, iPhone sales have made up over half of Apple's revenue. That means investors should be concerned if three new iPhone models can't give iPhone sales a meaningful boost. Daryanani said that he is still positive on Apple's stock due to the higher price of the iPhone X as well as an encouraging trend from the survey that shows more than half of customers prefer the $1,149 256 GB version vs. the $999 64 GB version of the iPhone X.